A critical component to rich media is securing your content and resources. 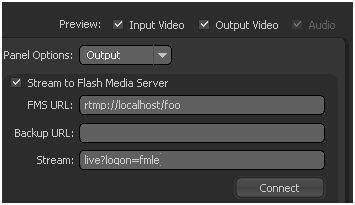 In this article I am going to cover how to restrict someone with the Flash Media Live Encoder or for that matter any encoder from publishing to the Flash Media Interactive Server. In the process I am going to show you how to allow someone with the appropriate permissions and the Flash Media Live Encoder to publish to the server. There are many ways to accomplish this goal. First there are Adobe partners that have written plugins for the Flash Media Server that allow you to restrict access to the server through the use of these plugins. There are also server side APIs that allow you to connect with other systems and data. For instance you can use the WebService class to create and access a WSDL/SOAP web service or the XML class lets you load, parse, send, build, and manipulate XML. In this short example I am going to use a server side event “onPublish” to retrieve the querystring and respond to a request to publish a live stream from the Flash Media Live Encoder to the Flash Media Interactive Server. Now there is a reason that I am calling out the Flash Media Interactive Edition and not the Streaming Edition and that is that the Streaming Edition does not support server side scripting. 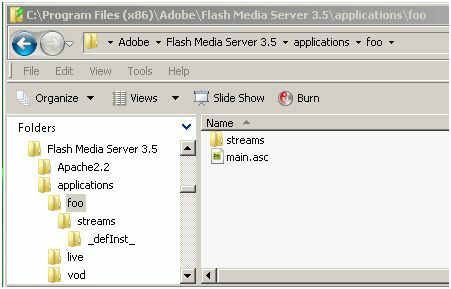 Server side scripts are written and stored in “.asc” files in an application directory inside the application folder on your Flash Media Server. As an example if I had a application called foo I would store my server side script (e.g. main.asc) in the following location. There are a number of events that you can work with on the server side; for instance onAppStart, onConnect, onPublish. You can find information about these and other events, methods and properties in the documentation. Lets take a look at the final server side script in the main.asc file. In the preceding code the events are in bold. The helper function that will extract the search term (i.e. the second parameter that we pass in to the extractQueryString function called arg) that we tell it from the querystring is green. The bit that disconnects an in appropriate publisher is red. First let me say that this is a very simple example that should be coupled with functionality that does more to integrate with existing systems (e.g. ldap) but after many calls from customers concerned that someone might be able to publish inappropriate content or use their bandwidth I thought I would at least get the ball rolling. The part of the script in red is a great place to look at integrating with other systems. Notice that in the if statement that I am simply looking for the string “fmle” this should really be a more robust solution but it will work for this simple example. In the preceding code onAppStart does just that it fires when the application starts. The onConnect fires when a client connects to this application. Finally onPublish fires when someone tries to publish a stream to the server. There are two parameters the first is the client object that represents the client publishing the stream to the server. The second is a reference to the stream that the client is attempting to publish. Even though I am not going to cover it in this article it is worth mentioning that you can use the stream reference to publish a stream from one server to another in the event that you want to propagate a stream across a number of servers. The value of this argument will have to be “fmle” or the attempt to publish will be denied. That should cover it. If you have questions or comments let me know. I will most likely follow this up with short article about swf verification. Great article and thank you for samples. However i would like to ask you to refer me to a good plugin to do the same thing. I’m not that sure of my capabilities in Flash. I can’t express how grateful I am for this information. I recently had my server hijacked by someone in India that used a live encoder to stream copyrighted videos from my server. This info is exactly what I needed to get me on the path to better security. Thank you! I am not sure where to add this authentication in the FMS Interactive Server 4? The livepkgr is a specific directory used to create http streaming content on the fly. The directory that you use will depend on the function you want. If you just want a stream that is rtmp and live you can use the live application (directory name under application directory). If you want video on demand you will use the vod directory under the applications directory. I am running Interactive 4 on Linux, where do you edit the main.asc file at? I did a locate on the file, added the code and it did not work. Do you have to copy the main.asc to another directory? I would like to get the server locked down, since anyone can connect to it. The main.asc is located in each application directory. For instance if you look at the installation directory you will see a directory called applications. You can create a directory in that directory with any name (no spaces). Inside of that directory create another directory called streams and inside the streams directory create another directory called _defInst_. You will put your ondemand video in this folder. You will place your main.asc in the first directory that you created under the application directory.